Actor Johnny Depp poses for photographers upon arrival at the premiere of the film "Black Mass" during the 72nd edition of the Venice Film Festival in Venice, Italy, Sept. 4, 2015. 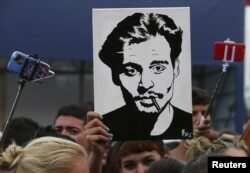 It was Johnny Depp's day at the Venice Film Festival. Judging by the acclaim greeting his performance in gangster drama "Black Mass,'' it may turn out to be Johnny Depp's year. A pallid, blond and balding Depp is virtually unrecognizable as real-life Boston mobster James "Whitey'' Bulger, who built up a criminal empire while acting as a longtime FBI informant - or "professional criminal consultant,'' as one character puts it. Depp's Bulger is charismatic, scarily calm and utterly ruthless. It's a remarkable transformation that could net him an Oscar nomination. But the actor says he has ready access to his dark side. Some are calling "Black Mass'' Depp's comeback film - though that would be news to the hundreds of Depp fans who camped out beside Venice's Palace of Cinema Friday, hours before the movie's red-carpet world premiere. A girl (C) holds up a portrait of actor Johnny Depp in front of the entrance of the venue of the 72nd Venice Film Festival, Sept. 4, 2015. The Hollywood Reporter hailed Depp's Bulger as one of his best performances, calling him "charismatic ... fully convincing and frightening.'' Variety said the "mesmerizing'' turn was "a bracing return to form'' after several under-performing films and years of "Pirates of the Caribbean'' antics. Cooper said he was fascinated by the "intersection of politics and crime'' in Boston during the 1970s and 80s. Bulger's brother Billy - played by Benedict Cumberbatch essaying a Boston accent - was a powerful state senator. His FBI contact was John Connolly (an intense Joel Edgerton), another tough South Boston kid torn between childhood loyalty and his duty as a lawman. Cooper tells the tale of power and betrayal without melodrama in a lean and at times bone-crunchingly violent film. Bulger disappeared in 1995 and spent 16 years as one of the nation's most-wanted fugitives before he was captured in California in 2011. Now 86, he is serving life in prison. "I've always wanted to try to be a character actor, more than the poster boy that they tried to make me, about 100 years ago,'' said the 52-year-old former teen heartthrob.